Location: Our Lady of Lourdes Primary School. It is very important that all eligible students attend this seminar. Master Azim Razak (7th Dan), whom many of you know from the gradings will be running this seminar. He will be providing valuable knowledge and experience that you will not be able to receive anywhere else. Master Razak is responsible for the management of the prestigious London Team; the London Team has produced National and Olympic standard athletes. 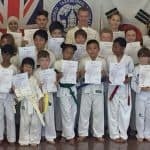 Master Razak is also a member of the British Taekwondo grading panel and has been in Taekwondo for over 30 years. He is one of the most respected instructors in the country. He will be providing tips and information to help improve your technical Taekwondo and help you on your way to Black Belt. And it is right here in Rottingdean! Normally for these seminars you have to travel half-way up the country to attend them. All eligible students are expected to attend.